Today’s Dietitian explores the history and nutritional attributes of this traditional nutrient-rich dairy alternative that continues to surge in popularity. These days, plant milks are emblazoned with clever packages and names, such as Ripple, Malk, and Good Karma. But long before these new age plant milks sprang to life, soymilk was the standby plant milk in markets. And it was around long before that—soymilk has been part of traditional diets for centuries. Historically, soymilk was made by soaking white soybeans in cold water, grinding them between stones into a slurry and filtering it through a sieve to make a “milk.”2 In Asia, this soymilk was then used to make the nutritious staple tofu by pouring the soymilk into a kettle to heat with a coagulant. The coagulant traditionally used was nigari, a natural substance—rich in calcium and magnesium salts—obtained from salt marshes. The coagulation of the soymilk created curds, which were formed into blocks in boxes, and then rinsed and compressed into “cheeselike” tofu.2 The modern tofu process today follows right along with this ancient technique, though with larger, more modern equipment and isolated coagulants. As is the case for tofu making, the current process of making soymilk isn’t all that different from former techniques, albeit with larger, more modern equipment. In fact, you could make soymilk in your kitchen with a blender, cheesecloth, and strainer, if you were so inclined. You can trace soymilk back to 1365 in China, when it was first documented by Han Yi under the name doufujiang (soymilk), according to William Shurtleff and Akiko Aoyagi, who have spent a lifetime recording the history of soymilk for the Soyinfo Center in California in a nearly 3,000-page 2013 sourcebook. In this book, they report a timeline for the history of soymilk, which Today’s Dietitian shares here. John Cox, executive director of the Soyfoods Association of North America, reports that in the United States, there’s an impression that everyone drinks cow’s milk, but that’s never been the case—many cultures don’t drink dairy milk. Scientists believe that the ability to digest lactose—allowing early Europeans to drink milk without getting sick—first evolved in the dairy farming communities in Central Europe. However, most adults worldwide don’t produce the enzyme lactase that gives them the ability to digest dairy milk.4 Historically in Asia, livestock were considered work tools rather than a source of milk, thus dairy wasn’t part of cultural traditions. Soymilk has been a longtime staple in diets among Seventh-day Adventists, as well as vegetarians and vegans. While many individuals still drink soymilk, today’s alternative, less-nutritious plant milks are increasingly taking the place of soymilk in plant-based dietary patterns. This is unfortunate, as soymilk reigns supreme in nutrients over these plant milks. Soymilk has long held its reputation as a nutritious alternative to dairy milk, being similar in nutritional value. 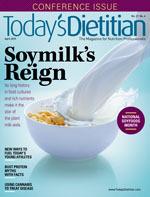 “There are many fortified soymilk products on the market today that are almost nutritionally identical to regular dairy milk, but with the advantage of containing no cholesterol or saturated fat,” says John Westerdahl, PhD, MPH, RDN, CNS, FAND, a plant-based nutrition expert and radio talk show host. One of the most significant nutritional contributions of soymilk is protein content. “Although other plant milks may provide a variety of benefits, they do not naturally contain as much protein per serving, unless added to the milk as a blend. Soymilk contains all of the essential amino acids,” says Chou, adding that one 8-oz glass contains about 7 g protein, compared with many plant milks that contain 0 to 1 g protein per serving. In addition to protein, fortified soymilk can provide a good nondairy source of calcium, vitamin D, and vitamin B12 to the diet, Westerdahl says. “The key is to look for fortified soymilks that contain these nutrients,” he advises. “Soy is unique in that it contains the antioxidant isoflavones genistein and daidzein,” says Ginger Hultin, MS, RDN, CSO, a spokesperson for the Academy of Nutrition and Dietetics and owner of Champagne Nutrition LLC. “These compounds have been linked to cardiovascular benefits, bone health, and even some anticancer benefits.” One serving of soymilk contains 25 mg isoflavones. When it comes to protein quality, the PDCAAS (protein digestibility-corrected amino acid score) for soymilk is the same as cow’s milk, Messina says. “Cow’s milk is higher in leucine, but the latest information shows that, probably, over the long run, protein type doesn’t have much of an impact on gains in strength and lean body mass. For those wanting to increase muscle and strength, making sure protein intake is adequate is key,” he says. One intriguing area of comparison is fatty acid content. Messina says that when one compares soy with whole milk—a fair comparison because consumers are choosing whole milk more often—dairy milk is higher in fat and saturated fat, but there’s controversy there because fat in dairy may not adversely affect cardiovascular risk. “But if you assume that cow’s milk has a neutral effect, soymilk would still have an advantage because it’s so high in polyunsaturated fats, which should reduce heart disease risk,” Messina says. Potassium is fairly high in both soymilk and cow’s milk, according to Messina. “Soy has some iron in it, which could be a factor, but it’s a small amount. Traditionally, we view nonheme iron as not well absorbed, but newer data suggest it’s better absorbed than acute studies suggest,” he says. Interestingly, chronic consumption of a high-phytate diet mitigates the inhibitory effect of phytate on iron absorption. In addition, according to Messina, much of the iron in soybeans is in the form of ferritin, which may be insensitive to inhibitors of iron absorption. He notes that soy is loaded with phytate and oxalate, yet the calcium availability is as good as cow’s milk. One study showed there was an approximate 5% reduction in blood cholesterol levels associated with soymilk intake compared with dairy milk, which is related to both the soy protein and fatty acid content of soymilk, according to Messina. As for the glycemic effect of soymilk, he says research shows similar effects as dairy milk. “It also may have a hypotensive effect. There’s data that consuming soy early in life reduces risk of breast cancer later on in life. There’s a strong hypothesis that just one serving per day is all girls need to consume, as long as it is made from whole soybeans,” Messina says. “Unfortunately, there has been quite a lot of misinformation around soy, so I have seen fewer options for soymilk in grocery stores over the years as more alternatives become available. I think consumers are fearful of soy, but wrongfully so,” Chou says. Dietitians can feel confident about recommending soymilk as part of a healthful diet for people who choose this option for numerous reasons, including personal dietary choices, plant-based eating styles, cultural food preferences, and food intolerances. According to the 2015–2020 Dietary Guidelines for Americans, the Healthy Vegetarian Eating Pattern highlights that fortified soymilk can replace dairy to support a plant-based eating pattern. In addition, the USDA MyPlate allows for soymilk—the only plant-based milk listed—to replace one serving of dairy milk within that food group. — Sharon Palmer, MSFS, RDN, The Plant-Powered Dietitian, is a plant-based food and nutrition expert who recently received her master’s degree in sustainable food systems from Green Mountain College in Poultney, Vermont. She also serves as the nutrition editor of Today’s Dietitian. 1. Watson E. US retail sales of plant-based milk up 9%, plant-based meat up 24% YoY. FoodNavigator-USA website. https://www.foodnavigator-usa.com/Article/2018/07/30/US-retail-sales-of-plant-based-milk-up-9-plant-based-meat-up-24-YoY. Updated August 10, 2018. Accessed February 15, 2019. 2. Shurtleff W, Aoyagi A; Soyinfo Center. History of soymilk and other non-dairy milks (1226 to 2013): extensively annotated bibliography and sourcebook. https://drive.google.com/file/d/1-Ot-XUZcGeTPnY7ZIFXFFNL8rZJoK-Lx/view. Published 2013. Accessed February 15, 2019. 3. Kohli D, Kumar S, Upadhyay S, Mishra R. Preservation and processing of soymilk: a review. Int J Food Sci Nutr. 2017;2(6):66-70. 4. Milk drinking started in central Europe. University College London website. https://www.ucl.ac.uk/news/2009/aug/milk-drinking-started-central-europe. Published August 28, 2009. Accessed February 15, 2019. 5. Vanga SK, Raghavan V. How well do plant based alternatives fare nutritionally compared to cow’s milk? J Food Sci Technol. 2018;55(1):10-20. 6. Messina M. Soy and health update: evaluation of the clinical and epidemiologic literature. Nutrients. 2016;8(12):E754. 7. Poore J, Nemecek T. Reducing food’s environmental impacts through producers and consumers. Science. 2018;360(6392):987-992. 1. Place all ingredients in the container of a blender and process until smooth. 2. Pour into two glasses. Enjoy! 1. Slice the squash in half horizontally, scoop out seeds, and slice into large pieces. Place squash pieces in a large pot of boiling water, cover, and cook for about 15 minutes, until they pierce easily with a fork but are still firm. 2. Meanwhile, heat olive oil in a small skillet or sauté pan and sauté onion and garlic for about 9 minutes, until tender. 3. Transfer onions and garlic to a 1-quart blender container. Add soymilk and Chinese 5 spice. 4. When squash is tender, drain pot into a strainer and cool squash slightly. Scoop out cooked squash with a spoon, removing from peel, and place in the blender container. 5. Process blender for a minute or two until mixture is smooth and creamy. 6. Pour blended soup into the pot and reheat for a few minutes until bubbly. Season with salt and pepper to taste. 7. Pour into soup bowls and garnish with chopped almonds and additional Chinese 5 spice, if desired. 1. Place cornstarch in a medium saucepan and gradually mix in soymilk with a whisk until it’s smooth, with no lumps. 2. Add maple syrup and vanilla and heat over medium heat, stirring constantly with a whisk until smooth (about 3 minutes). Add lavender—just a pinch at a time, until it achieves your desired taste preference (a little goes a long way). 3. Remove from heat and cool, stirring with a whisk occasionally, for 10 minutes. Chill in the refrigerator for at least 1 hour and mix well before serving. 4. To serve: Fill individual serving dishes with 1/2 cup cream pudding and sprinkle with sea salt. May garnish with additional dried or fresh lavender. Serve immediately.